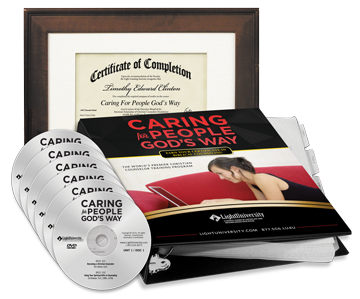 Caring for People God’s Way will help equip you to respond to the growing needs and provide competent and compassionate care to those who are hurting. Each unit comes complete with work text and exams. Light University is the epitome of flexibility, allowing you to choose from one of our convenient five or eight week schedules. Also, you can study when and where you want. please fill out this form and one of our friendly Light University admissions experts will contact you immediately. Gain all of the crucial knowledge necessary to help others in need. Our faculty include over 150 of today’s most respected and influential Christian counselors, pastors and educators. Plus, the prestigious American Association of Christian Counselors endorses Light University programs. Our innovative and easy-to-use online “Virtual Classroom” affords you the opportunity to study where you want. Plus, our terms are only five weeks in length. Not only will you earn your certificate or diploma through Light University Online, but you also have the opportunity to earn college credit for your work or seek recognized credentialing. Scholarships are available and comparable programs would cost you at least double what you will pay at Light University Online… if not more. Is Light University Right for Me? Since 1999, Light University has been offering training and continuing education for individuals who have a desire to increase their knowledge and skills in biblical counseling, life coaching, crisis response, and Christian care. Our students are serving in churches, counseling agencies, and communities all over the world. They are counselors, Sunday school teachers, pastors, women ministry leaders, lay leaders, and more… individuals just like you. If you answer yes to any of these questions, God may be calling you to a special ministry of caring. Do family and friends often come to you for help? Are you gifted with a heart that desires to help people? issues people struggle with in today’s world? WORLD-CLASS FACULTY: Our programs were developed and are instructed by some of the most recognized, influential, and distinguished Christian leaders, counselors and educators in their fields. To claim your Light University Executive Scholarship of $380 and quick enrollment savings of $51, please fill out this form and one of our friendly Light University admissions experts will contact you immediately.